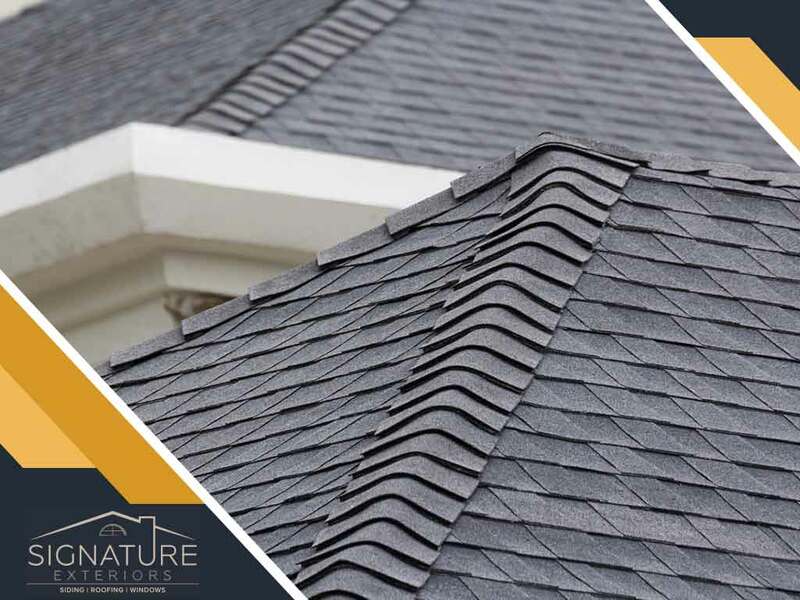 While planning for a roofing replacement project, you may have come across suggestions like changing your gable roof to a hip roof. Signature Exteriors takes a closer look at these two popular roofing styles. A gable roof is the most recognizable roofing style anywhere. In fact, ask any child to draw a house, and they will likely draw one with a gable roof. Nevertheless, this simple roof style has stood the test of time and is still seen on new houses. Gable roofs are typically built with a 10/12 pitch or steeper and are especially effective in shedding large amounts of rain and snow. The attic space can be later converted into an extended living space. Variations of a gable roof include the saltbox roof, an asymmetrical version that features one side with a two-story span and a gambrel roof, a traditional French design that features two planes to a side. A hip roof is the four-sided version of gable roofs, forming trapezoidal long sides and triangular short sides. Existing gable roofs can be converted into a hip roof without completely dismantling the entire roofing system. Building a hip roof from scratch will cost more, as it will require more roofing materials. Variations of this style include a Dutch gable, where the upper half of the short side has a gable, and the mansard roof, which is the four-sided, eight-planed equivalent of a gambrel roof. A pyramid hip roof is a perfectly-symmetrical hip roof installed on homes with a square floor plan. Hip roofs have better wind resistance and are ideal for areas that are often hit by storms. Construction is more complicated than gable roofs, hence requiring a capable roofing contractor. Instead of a single ridge, a hip roof has five ridges, meaning it needs proper installation of flashing, ridge caps and upper roof ventilation. Hip roofs require more work if it will be used as an extension, as it will require the addition of dormer windows. Whatever roof style you end up choosing, we are the roofing contractors who can build them for you. Call Signature Exteriors today at (866) 244-8029. You can also fill out our contact form to schedule a free quote. We serve many areas in and around Greenwich and Danbury, CT.
« The Basics of Roof Pitch: What You Need to Know	» Roof Dormers: Should You Add One to Your Home?